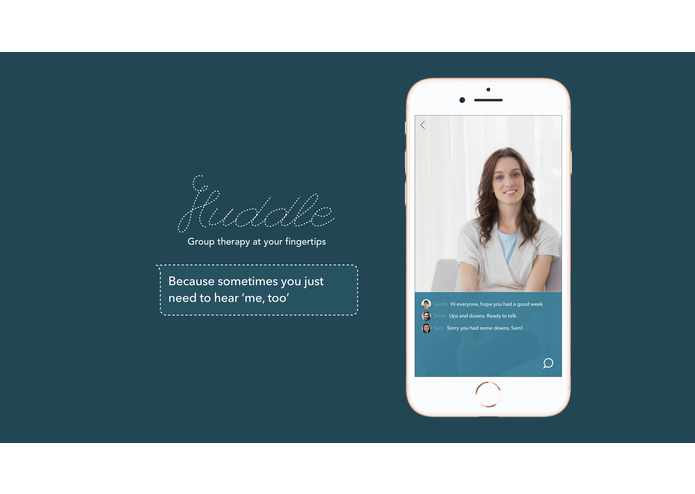 Huddle is online group therapy facilitated by mental health professionals with real-time community response. What it is: Huddle is online group therapy facilitated by mental health professionals with real-time community response. 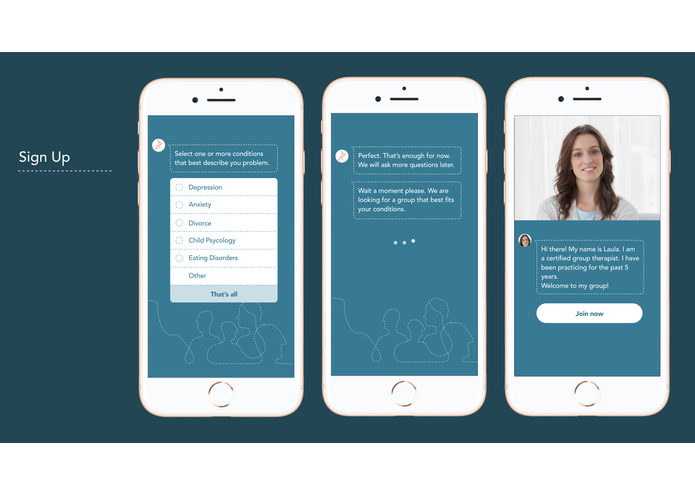 Why we created it: Many of us face invisible problems alone, and it is shown that connecting with others is one of the most effective ways to start feeling your best again. Sometimes the most comforting words in the universe are “me too”. This is often more exhausting to do during difficult times, so Huddle provides an approachable, easily accessible community who are similarly invested in living well. 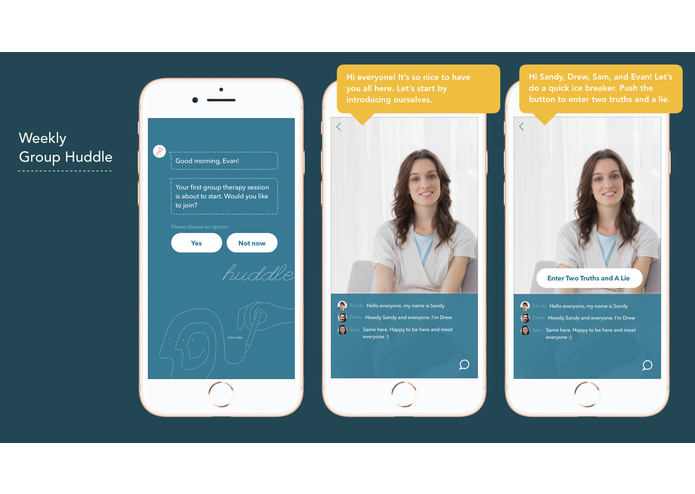 Through simple and novel prompts about what you felt and how you went about your day, Huddle enables live video discussions with your coach or therapist and instant reactions from fellow respondents. You can also check-in daily with your community or 1:1 with your coach. 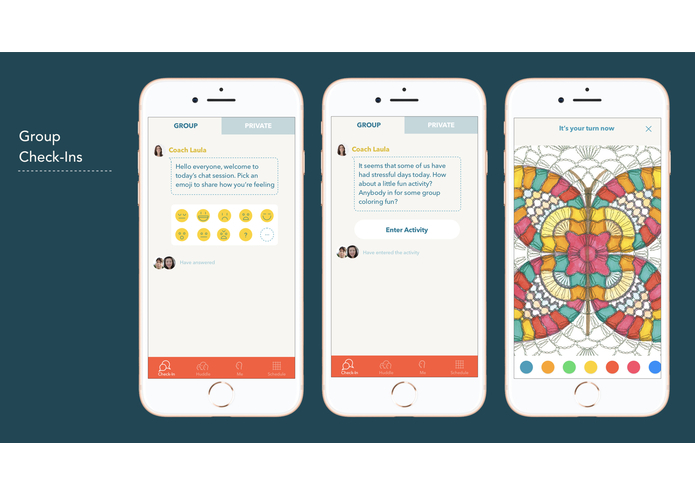 You are just one word or emoji away from motivating ideas and a shared sense of belonging. Who it works for: Those who are concerned with their mental health or are already working through a condition. Those who are seeking better accessibility and flexibility to include therapy into their busy schedules, or prefer the ease of mobile apps. Those who are more hesitant to speak in person and prefer typing and increased privacy. The act of typing is similar to journaling and is shown to help process feelings. 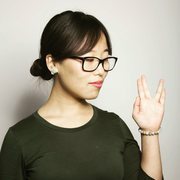 Those who lack mobility, or who want a lower cost solution to connecting with an individual therapist or group sessions. Why this works: it is scientifically proven that group therapy can effective treat a variety of conditions, such as anxiety, depression, grief, trauma, self-esteem, and more. Group therapy creates a safe, supportive setting where participants can air their struggles, receive encouragement which creates a shared sense of belonging, and prevent isolation by seeing that they are not alone. Under the guidance of a therapist, interactions with others can pinpoint the issue, provide new information, and provide feedback to enable self-motivation. Coach prompts: How are you feeling today? (Respond in one word/short sentence, or by selecting emojis (fistbump, cheers). What was your day like? (Respond by selecting from graphics (photos of facial expressions, weather, daily life scenes like traffic/late hours at the office/binge eating). Finish the sentence (Today I thought / did / behaved). Follow-ups and polls: What went well? What did you do to take care of yourself? What are you grateful for? What did not go well? When did you need a timeout? What triggered it? When does it happen? Who’s involved? What can you do? Interaction: Icebreaker for very first group introduction: two truths and one lie, etc. 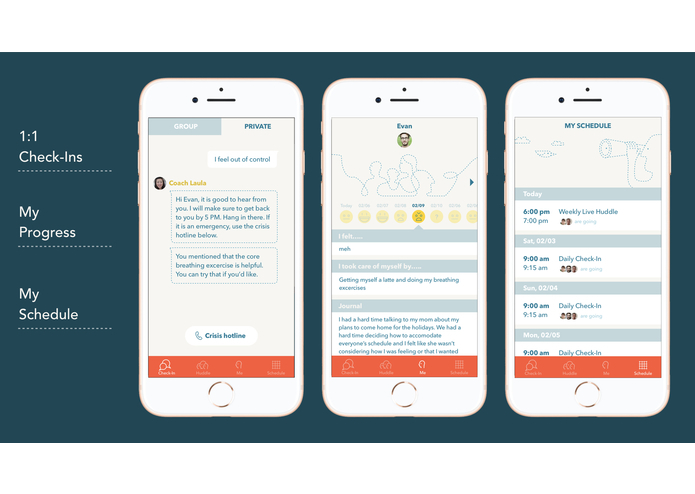 Users chat and comment real-time: share stories, quotes, photos, suggestions. Other types: games such as group coloring book, etc. 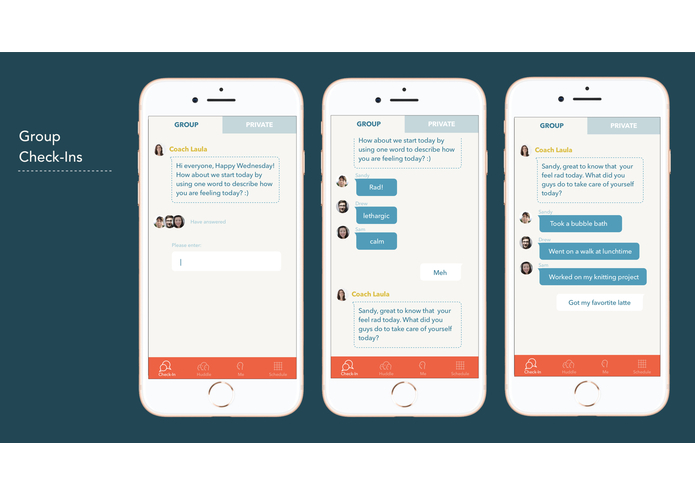 Users can chat personally with the coach. 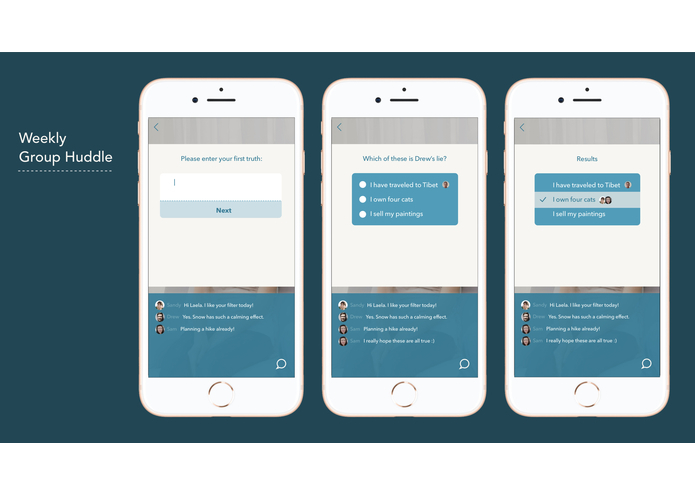 System provides automated response to all private messages indicating when the coach will reply. In addition, coaches maintain a profile of all participants and use it when replying to ensure relevant feedback.